The Battlefield of Waterloo (1815) sites with Wellington and Napoleon museums make an interesting day-trip from Brussels in Belgium. The Battle of Waterloo, fought on June 18, 1815 near Brussels in Belgium, was one of the largest battles ever in Europe prior to the carnage of the twentieth century. Napoleon Bonaparte famously lost here against the allied armies led by the Duke of Wellington and the Prussian forces led by Blücher. Two centuries on, visitors still flock to the battlefield site to see the sights associated with the battle and the main adversaries. Visiting the Waterloo battlefield sites and museums is an easy day-trip tour from Brussels by car or on public transportation. The battlefield area at Hameau du Lion (Lion’s Hamlet) with the battlefield visitors’ center, Lion’s Mound, Panorama Painting and historical films to the south of Waterloo. Waterloo town center with the Musée Wellington (Museum in the Head Quarters of the Duke of Wellington) and the St Joseph’s Church. The Museum in the Last Headquarters of Napoleon Bonaparte to the south of the battlefield. Tickets can be bought for the individual sights or a combination Pass 1815 that gives access to all three sites. Visitors to the Waterloo Battlefield (Champ de Bataille) usually first congregate at the Hameau du Lion (Lion’s Hamlet) with its visitor’s center, the lion mound, and other formal sights. Currently, visitors see two short movies, which provide a good introduction to the Battle of Waterloo: a short documentary overview of the battle and an extract from Serguei Bondartchouk’s epic 1970 film Waterloo. 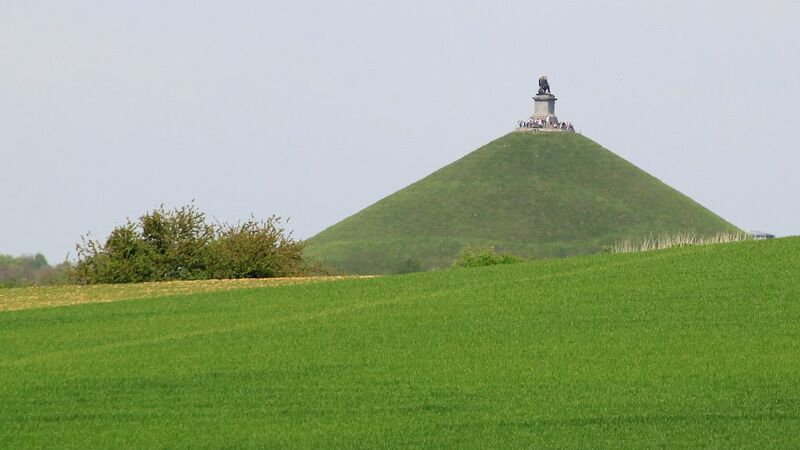 It is 226 steps to the top of the Lion’s Mound (Butte du lion) from where the battlefield can be studied. Further sites such the farms (ferme) Hougoumont, Haie Sainte, Belle Alliance and Papelotte, as well as other smaller memorials can be seen from here. 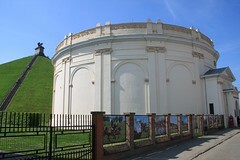 A circular panoramic painting (1912) of the Battle of Waterloo is in a special round building right next to the mount. The painting measures an impressive 110 by 12 m.
A new visitors center is being built with a planned opening by mid-2015 in time for the bicentenary of the Battle of Waterloo. It will incorporate the current movie theaters and wax museum and further exhibitions. The center will be underground to not disturb the integrity of the battlefield – a valiant effort was it not for the motorway and the national road towards Charleroi that both cross right over the battlefield anyway. In the heart of the small town Waterloo is the Wellington Museum in the inn where the Duke of Wellington established his headquarters. The museum is wonderfully old fashioned and stuffed full of items related to the Battle of Waterloo, information, diagrams and maps. A great audio guide takes visitors through the highlights in around 40 minutes but it is easy to spend several hours here for those interested in the finer details. Across the road of the Wellington Museum is the St Joseph’s Church with the Royal Chapel. It has many memorials for the fallen at the Battle of Waterloo, as well as a marvelous dome from 1690. The tourist information office in the adjacent old presbyter has useful information on exploring the sights and also sells the 1815 Pass that give access to all the Waterloo sites. The Waterloo-Église bus stop for bus W and 365 is directly in front of the church. The Musée dernier quartier-général de Napoléon is another wonderfully old-fashioned little museum in the Caillou farmhouse where Napoleon spent the night before the battle. The five rooms are full of items related to Napoleon and the Battle of Waterloo. 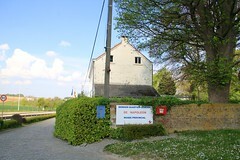 The Museum in Napoleon’s Last Headquarters is around 4 km to the south of the Lion’s Mound. See Visit Napoleon’s Last Headquarters at Waterloo for details. Tickets can be bought for individual sites or as a combination ticket for all three Battle of Waterloo sites. Opening hours are daily from 9:30 to 18:00 (April to September) and 10:00 to 17:00 (October to March). The museums are closed on December 25 and January 1 but the Lion’s Hamlet sites are open all year. 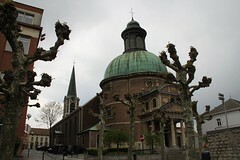 Getting to the Battlefield of Waterloo is easy by car, train or bus from Brussels, Charleroi and most parts of Belgium. Using the frequent buses is a simpler option from Brussels than the train, although combining the train and bus is a good option for travelers from other parts of Belgium. A car certainly makes exploring the various sites easier but a bicycle may be an even better option to explore the lesser sights and minor monuments. Unfortunately, bike rental is not available in the near vicinity. Hiking is also a good option to explore the sites near the Lion’s Mound but it is a good 4 km hike from here all the way to Napoleon’s HQ. The Battlefield of Waterloo is also a good first / last stop for visitors traveling via Brussels-South Charleroi Airport (CRL), as it can be seen en route to or from Brussels.